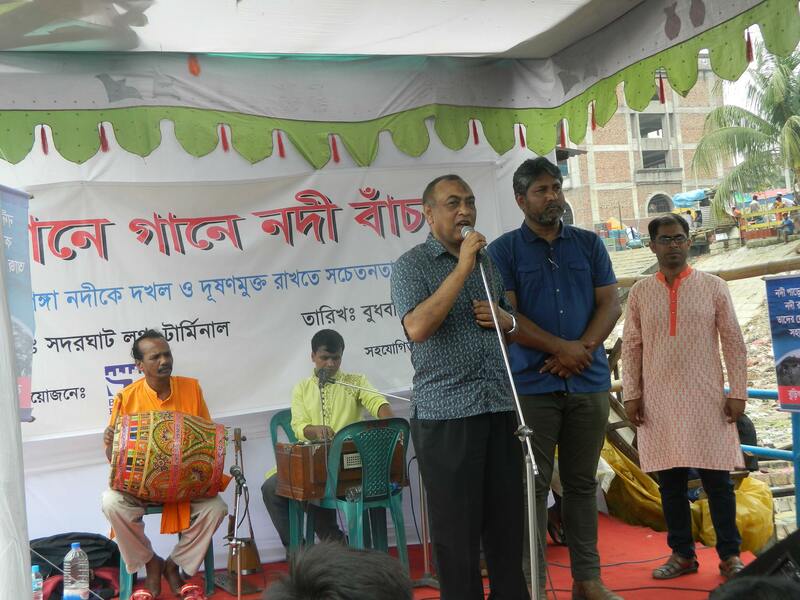 By the initiative of Buriganga Riverkeeper, an awareness event titled as ‘Save River through Song’ was organized on Wednesday, 3rd of May 2017. Dhaka Sadarghat Launch Terminal was chosen as the inauguration venue for this event. Honorable Chairman of National River Conservation Commission (NRCC), Mr. Md. Ataharul Islam inaugurated the program. Among others, Joint Secretary of BAPA and Buriganga Riverkeeper, Mr. Sharif Jamil; Russia’s eminent environmental researcher, Dr. Eugene Simonov; Joint Secretary of BAPA, Mr. Mihir Biswas; Executive Director of Sadarghat Launch Terminal, Mr. Gulzar Ahmed; members of the Old Dhaka Environmental Movement Forum, Nazimuddin, Imran Hossain and prominent Lalon researcher Hirak Sardar were present in this program. Mr. Md. Ataharul Islam, Honorable Chairman of the National River Conservation Commission highlighted the illegal encroachment of Buriganga. He mentioned that the government will have to come forward along with the support from public to protect the river at all cost. 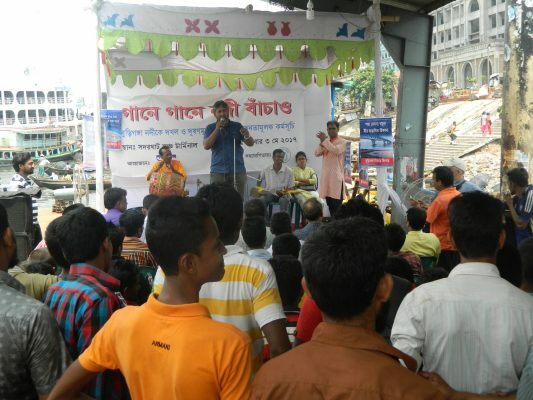 Joint Secretary of BAPA and Buriganga Riverkeeper, Mr. Sharif Jamil informed that the country’s conscious civil society has been continuously protesting through various programs, meetings, seminars for the last few years in order to give awareness to the government as well as the public about river pollution and encroachment. But, our government has not taken it into consideration. Besides, the general public is also responsible for polluting the river, Buriganga. They are not aware of the fact that most of these disposed wastes will not degrade within the next hundred years. Wastes are also being disposed from Hazaribagh tannery into the Buriganga. And the carcinogenic pollutants mixed in the river water are the primary cause of many kinds of diseases including cancer. Joint Secretary of BAPA, Mr. Mihir Biswas advised that immediate disciplinary action should be taken against the river encroachers and polluters. He urged the government to implement the verdicts given by the High Court to protect the Buriganga and surrounding rivers of Dhaka City. All industrial sewage lines have to be disconnected from the river. Russia’s environmental researcher, Dr. Eugene Simonov said that problems related to Russian river pollution are not similar to Bangladesh. However, the harmful effects of polluting rivers should be educational in Bangladesh. Collaborative measures among Russians, their government and their neighboring countries are being used to fight against the pollution of rivers in Russia. Before and after the arrival of the guests, a band named ‘Rangmohal’ performed Bengali folk songs led by renowned Lalon researcher, Mr. Hirak Sardar. 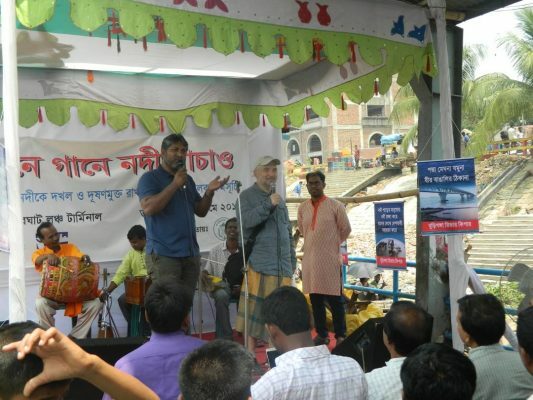 They provided information by singing songs and requested the people residing near Buriganga to come forward for keeping the river free of pollution.